Sanho Tree, a drug policy analyst from the Washington based Institute for Policy Studies, has contributed a chapter on drug policy reform to a new book titled Mandate for Change, published this month and presented to the White House last week. In the chapter he explores a series of familiar approaches for positively reforming drug policy, as well as suggesting a novel approach - using secret ballots of legislators - to help move beyond the deadlock created by political fear of engaging with 'third rail' issues*. Since President Richard Nixon first declared a “war on drugs” in 1971, the goal of a drug-free America is as remote as ever. Users who seek illicit drugs have little problem obtaining them cheaply, quickly and with ease. Indeed, the government’s own major indicators of success (measuring the price, purity and availability of drugs) show dismal trends. In 1969, the Nixon Administration spent $65 million on the drug war at the federal level; in 1982, the Reagan Administration spent $1.65 billion; in 2000, the Clinton Administration spent more than $17 billion; and the Bush Administration is currently spending well over $20 billion per year. We have had ever-harsher sentencing, and more people are employed to wage the drug war than ever before. The problem is not that we are under-spending or not being tough enough, but that drug war politics constantly gets in the way of sound, evidence-based policy. Not only can some drugs have very harmful results on physical and mental health, but the drug war itself is now causing as much (if not more) harm than the drugs themselves. This is not an acceptable substitute for an effective drug control policy. Reduce the potential harms caused by drug abuse. Fully fund treatment on request. Promote evidence-based harm reduction strategies. Promote alternatives to incarceration for low-level nonviolent drug offenders. End major source country eradication programs. End over-reliance on counter-productive crackdown policies such as the Merida initiative. Stop searching for easy answers. So how can politicians who care about getting re-elected make fundamental reforms without being electrocuted by the third rail? Just as the much-needed reforms of U.S. drug policy are counter-intuitive (where being tough is often the opposite of being effective), so too is the way out of this political stalemate. In order to get a more responsible legislature, it may be better to have less accountability—at least temporarily. ...An anonymous straw poll can create a temporary firewall separating sound public policy from partisan politics—or what Scott McClellan, Bush’s former White House press secretary, calls the permanent campaign. Indeed, this may be the only viable way to undo the polarizing legacy of Karl Rove. With so many crises to address and such powerful interests opposing reforms, Washington cannot afford to play partisan games and conduct business as usual. Those who were elected based on a pledge of a “different kind of politics” in a year of “change” should consider this method of cutting the Gordian Knot and breaking the logjam in Washington. The expression comes from the high-voltage third rail in a subway system and is used to refer to controversial issues that are thought to be political suicide for elected officials to engage. Other examples of third rail issues include U.S. aid to Israel, immigration reform, funding for law enforcement, gay marriage, military base closures, national health care, raising taxes, etc. The media today is full of reports about a massive military operation in the Helmand province of Afghanistan, codenamed DIESEL. Closer examination reveals reporting of the operation to have been dramatically propagandized by the Ministry of Defense, with the media acting as their willing - if somewhat confused - accomplices. Somehow a story about less than a £100,000 worth of raw opium has been transformed into a story about £50,000,000 worth of 'deadly heroin'. “A daring military operation in Afghanistan has seized heroin and drug-making chemicals with an estimated final street value of more than £50 million”. 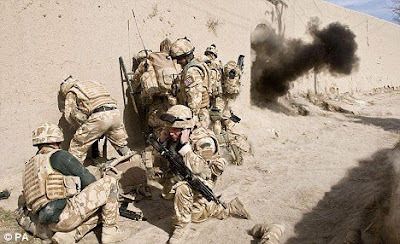 “British forces have seized £50 million of heroin and killed at least 20 Taliban fighters in a daring raid that dealt a significant blow to the insurgents in Afghanistan." 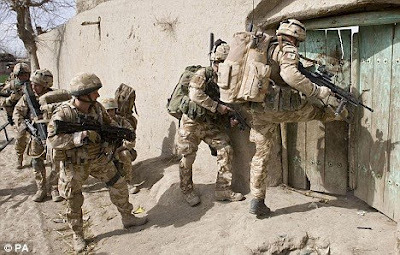 "Operation Diesel: British troops have taken £50million worth of heroin during an attack on a remote Taliban stronghold in Afghanistan"
These are just 7 out of the 100s of reports (600+ listed on Google news), each of the above with a different version of events. They cant all be right, so which one is? Bizarrely enough, a cursory check of the Ministry of Defence's online account reveals they are all wrong. The MOD website account describes three separate drug finds: one of ‘over 60kg of wet opium’, another of ‘over 400kg of raw opium’ and a third, ‘the largest find of opium on the operation, nearly 800kg’. Along with this opium a “massive supply of the essential chemicals required to make heroin were discovered; sacks of Ammonium Chloride, barrels of Acetic Anhydride and other chemicals that were piled up ready for use”. So operation DIESEL, in reality, resulted in the finding and destruction of somewhere in the region of 1300kg of unprocessed opium and an a quantity of the chemicals required to process opium into heroin. A few quick sums: According to the UNODC the 'farm-gate' price for opium in Afghanistan in 2008 was $85 a kilo, and these DIESEL stockpiles were presumably not far from the Helmand farms on which they were produced. 1300 x 85 = $110,500, in other words, opium worth approximately £78,000 to the Taliban, at this point in the supply chain. Were this 1300kg of opium to have been turned into low grade heroin (and we can reasonably suspect that this was what was going to happen), on the basis that it takes around 10kg of opium to produce 1 kg of heroin, it would have produced around 130kg. If the ‘street price’ of a kilo of heroin in the UK is estimated to be around £50- 75,000, then 130 kilos would earn you somewhere between £6.5 and £9.7 million. A very large sum of money certainly, albeit nowhere near £50 million. The UK street price of a kilo of heroin is, however, vastly inflated above what a kilo of heroin in Afghanistan is worth to the Taliban – the only ‘farm-gate’ price estimate I can find is £450*. But that seems low so lets be generous and put it at a nice round £1000; you are still looking at a Taliban heroin haul worth only £130,000 (and even if the Taliban sold it on the next link in the supply chain at some point in the future for ten times this, the figure only reaches £1,300,000). According to the Independent report the following were found: 5,000kg of ammonium chloride, 1,025 litres of acetic anhydride, 1,000kg of salt and 300kg of calcium hydroxide, which the MOD tells us is exactly enough chemicals to process a conveniently media friendly total of £50million pounds (UK street value) worth of heroin, but this would only be the case if there had been another 5-10 tons of opium seized, which there wasn't. The chemicals themselves are not especially hard to get hold of, or expensive (relative to the profits being made anyway), and processing opium into low grade morphine/heroin for transport is not especially difficult. None the less, through the prism of MOD drug war propaganda and lazy journalism a story about £78,000 worth of opium has miraculously transmuted into a story about £50,000,000 worth of ‘deadly heroin’. So lets be clear; Hutton claims '£50million worth of narcotics' was seized, a ‘fact’ which is demonstrably shown to be untrue by the very same report he is quoted in. Numerous media outlets in the UK and around the world then ran the story that '£50m of heroin' was seized (Daily Mail, Telegraph, BBC etc) – even though no heroin was seized and the 50million figure is pure fiction (one that goes some way beyond the tired old 'make the seizure sound as big as possible by quoting the street price’ trick). The MOD report even opens with the (slightly different) claim that they captured ‘drugs, chemicals and equipment with a UK street value of £50m’ – which is also multi-tiered nonsense. Worse still, and even if you want to argue the toss over the street value figures, the Hutton quote appears to deliberately imply that the Taliban have somehow been deprived of £50million in funds by this action – when in fact the reality is probably nearer £130,000, and this is assuming that these were indeed establishments entirely in the control of, and serving the profits of the Taliban, which again we have to take on trust from the MOD, and assuming they had a way of establishing it as fact. The Taliban and network of opium farmers also have stockpiles of opium, estimated by the UNODC to run to several 1000's of tons, so it is unlikely this raid will have any serious impact on supply. Moreover, evidence clearly suggests (and indeed the UNODC have argued) that restricting supply serves to increase prices - so the the net impact on profits of sporadic interdiction successes will be even less - potentially even boosting the value of remaining stockpiles. According to the UNODC’s most recent Afghanistan report the Taliban are making between $250 and $470 million (or £175 - £330 million) a year from the Afghan drug economy (both in taxing poppy farmers and direct involvement in production and export) based on production of between 7 and 8 thousand tons of opium. This rather puts some of the ministers’ grand claims into perspective; this mission prevented maybe £100k in Taliban profits, and destroyed just over one ton of opium (and 20 dead Taliban). To achieve this triumphant success took 700 troops and veritable fleet of high tech armoury and helicopter gunships (“including RAF Chinooks, Royal Navy Sea Kings and Lynx, joined by US CH53 Sea Stallions”). It will all have doubtless been fantastically expensive, and whilst we are in no position to estimate exactly what the operation did cost (PQ anyone?) we can be sure it would have been many many millions. This is nothing less than a classic example of war time propaganda – and the madness of the drug war requires more propaganda to support it than most. Reading the MOD report makes this all the more clear. The media were provided with action photos, and action video footage as well as an account that reads like a Boys own war story. The targets are variously described as ‘labs’, ‘drug factories’ and ‘processing plants’ discovered in a ‘chain of compounds’, all sounding rather more like a Bond-villain’s high-tech lair than the mud huts full of dirty plastic bags and rusty barrels we see in the video footage. It has been a quite brilliant propaganda coup for the MOD, with the media uncritically reporting their account, ludicrously inflated statistics and all (and still almost all of them getting even that completely wrong, including the broadsheets). Some of the reporting is extraordinary; The BBC even ran the ‘Raids seize £50m of Afghan heroin’ headline, despite in the body of its report noting that ‘Troops destroyed 1,295kg of wet opium, estimated to have a street value of more than £6m as heroin’. The need for such propaganda is not surprising. The Afghan conflict is a disaster; despite many billions being spent by the UK, the country is falling apart. The Taliban are resurgent, there is no evidence that the attack on the drug economy is achieving anything positive in the UK or Afghanistan, and the UK soldier casualty list has grown to 145 (one more announced today), not to mention the US and Afghan casualties. The MOD obviously need stories of success like this more desperately than ever, to give the impression they are 'winning' even when the opposite is true. That the operation was 'brilliant', 'daring', 'brave' and 'skillful' is not the point - it does not mean that it wasn't also ultimately futile or even counterproductive. The last thing the Government wants is for people to be told the truth; not just that the Afghanistan drug war is a disaster, but that it is the Government’s complicity in global drug prohibition that gifts control of the completely unregulated opium market to the Taliban insurgents and War lords in the first instance. Half of the worlds opium production is entirely legal and regulated for the medical opiates market (a small proportion of which is prescribed to addicts as heroin) and this legal production is not funding any paramilitary groups, mafiosi, or terrorists. We do have a choice. More surprising perhaps is that the media, even what we like to think of as the quality end of the market, were so happy to uncritically regurgitate it all. Questioning the Government's account of foreign wars in not a betrayal of our troops – quite the opposite. It is what the media should be doing, and we have been badly let down. I have now spoken briefly to the MOD press office. They maintain that the UK street price calculations are based on the heroin being sold at 40% purity. The calculations above are based on the UK street price of a kilo of heroin being sold at £75K. This translates into £75 a gram which is around double the usual street price anyway - so this would not substantially alter the analysis. Even if we do double the UK street price valuation - this still only takes it to a range of £12-20million. *The £450 figure comes from this report: Matrix Knowledge Group (2007). The illicit drug trade in the United Kingdom. Home Office Online Report 20/07. London: Home Office. It is a bit confusing - it seems too high to be referring to opium (unless you go back to 2001-2003) but does define farm-gate price of 'heroin' as the price received by the farmer before any subsequent processing’ - any clarification of this or alternative data would be appreciated. 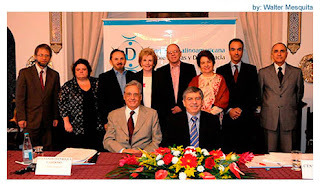 The Latin American Commission on Drugs and Democracy, convened by former presidents Fernando Cardoso of Brazil, Cesar Gaviria of Colombia and Ernesto Zedillo of Mexico in order to evaluate the impacts of the 'war on drugs', has released a statement this week saying that prohibition has failed and calling for a 'broad debate about alternative strategies'. ‘Current drug repression policies are firmly rooted in prejudices, fears and ideological visions. The whole issue has become taboo which inhibits public debate…. Hence, breaking the taboo and acknowledging the failure of current policies and their consequences is the inescapable prerequisite for opening up the discussion about a new paradigm leading to safer, more efficient and humane drug policies…. The way forward lies in acknowledging the insufficient results of current policies and, without dismissing the immense efforts undertaken, launching a broad debate about alternative strategies…. Some serving Latin American presidents have gone further, explicitly calling for decriminalization of possession for personal use (see blogs on Kirchner's call for decriminalisation and Zelaya's statement on legalisation). However the experience of former Mexican president Vincente Fox who was persuaded by US officials to carry out u-turn when he suggested a similar policy may have chastened the authors of this report. It would have been welcome to see some of those 'efficient and humane policies' explored in more detail. None the less, this is another indication that the policy climate in the Americas is shifting in the positive direction, and even if the longer term answers are not yet fully formed the new tone of pragmatism and critical engagement is all for the good. Drug politics and drug pragmatism - home and abroad. Interesting times in the drug debate on the national and international front. At home the rather sorry ecstasy reclassification debacle comes to its conclusion with the ACMD recommending a move to B, the Home Secretary saying no, sorry, it’s staying in A, and no debate at all about whether or not the ABC harm ranking/hierarchy of criminal penalties system is a good idea or not. Science has not so much taken a back seat in the debate, it has been forcefully ejected from the car. It's perhaps not surprising that we rarely find ourselves with serious debating opposition amongst police officers if this is the best they can manage:( Five Live breakfast show the segment you want is 2 hours and 54 minutes in). From the Chief Superintendants' Association, Ian Johnston’s very weak position discounting the ACMD's recommendation to downgrade ecstasy, relies solely on the 'sending out the wrong message' mantra, but he is entirely unable to back it up. It is surprising the pro-drug war authorities still put anyone up for a debate at all. They come across as seriously divorced from reality, looking like ill informed ideologues, or worse, propagandists – then lose. Which is why the Home Office don’t dare debate drug law reform in any live media format, ever – and if they are occasionally caught on the hop, they wheel out a pre-drafted line about debating alternatives being a 'counsel of despair' and telling us, once again that they are 'turning a corner'. On a more positive front there is a great piece in today's Independent: The Big Question: Do we need a new debate about relaxing drugs policy in Britain? "Things have gone from bad to worse, there is no possibility of an honest discussion now. Anyone who sticks their head above the parapet and calls for a rational consideration of the drug laws gets it shot off and kicked around by a horde of lunatics." A slightly different, US-focussed version of this piece appears in the Huffington Post. On Wednesday 11th Feb the Advisory Council on the Misuse of Drugs (ACMD) will announce the outcome of its review of the classification of ecstasy, and in all likelihood will recommend it be downgraded from Class A to Class B. “Parliament is reveling in moral grandstanding and populist posturing by eschewing the science on ecstasy. Truth is always the first casualty in any war, including the war on drugs. Given that the Government overruled the ACMD on cannabis classification, and has made it clear that whatever the evidence ecstasy’s classification won’t change, this entire exercise was doomed before it began. “Drug prohibition is unique in the public health field in using criminal sanctions to reduce social and health harms. It is also uniquely ineffective. There is no evidence that punitive law and its enforcement has more than a marginal impact on levels of drug use or misuse. Come and discover the fascinating history of drugs propaganda and see how it has affected everything from government policy to Daily Mail headlines. The discussion will be accompanied by a screening of highlights from the original, 1936 Reefer Madness and the audience is welcome to field questions. Come along and join in, or just watch the fun! Ben Goldacre is an award winning writer, broadcaster, and medical doctor who has written the weekly Bad Science column in the Guardian since 2003. Mike Jay is an author, broadcaster and historian who has written extensively on history and culture of drug use and appears regularly on BBC TV, Channel 4, Radio 3 and Radio 4. Steve Rolles is Head of Research for Transform Drug Policy Foundation, a charitable think tank seeking to bring about regulated markets for currently prohibited drugs. Entrance is free of charge for Reefer Madness matinee audience - CLICK HERE to book your matinee ticket and secure a place at this exciting event! The following editorial by Danny Kushlick was published in the the journal; Addiction Research and Theory (15(2): 123–126) in April 2007*, and is reproduced here as much of it seems relevant to current debates, both on this blog and in the wider drugs field. 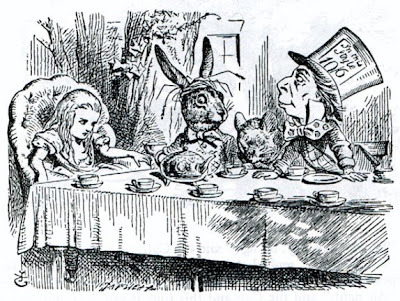 Viewed from a public health and wellbeing perspective, you could be forgiven for thinking that drug policy is developed at the Mad Hatter’s tea party. Huge numbers of legal drug users are effectively ignored, whilst relatively tiny numbers of illegal users have enormous time and resources spent on stopping them using. I am going to suggest that policy is not rationally based upon sound public health or harm reduction principles, but rather that it is skewed to the point of ridiculousness by the Government’s denial of the counter-productive effects of drug prohibition. The drugs in the UK that contribute overwhelmingly to public ill health are tobacco and alcohol. Both are legal, with tobacco sales oddly, legally sold to those over the age of 16, as opposed to 18 for alcohol. There are over 10 million regular tobacco users and 40 million alcohol users. Alcohol is implicated in about 40,000 deaths per year, with 120,000 for tobacco. Tobacco products carry a health warning but no ingredients list, whilst alcohol products carry neither. Cocaine and heroin also contribute to public ill health but at much lower levels of use. Both are illegal and consequently there are no controls on their production, sale or use, apart from the blanket prohibition that aims, fantastically, to eliminate them from society. There are an estimated 340,000 problematic heroin and crack cocaine users in the UK and much of the ill health associated with their use is directly related to their illegality. Within the national ‘drug’ strategy there is no discussion of the needs of our 10 million plus tobacco users, four million problem drinkers or our one million prescribed tranquilliser users. The reason: our commitment to drug prohibition (and the orchestrated demonisation of illegal drugs that has gone with it) has blinded us to the fact tobacco, alcohol and tranquillisers are drugs. And more importantly, that the use of licit drugs constitutes by far the bigger public health problem. What does the Government’s Talk to Frank website say about cocaine and alcohol ‘addiction?’ Under the heading ‘Chances of getting hooked’ it says: ‘Coke is very addictive. It can be difficult to resist the craving and strong psychological dependence due to changes in the brain. Recent evidence suggests possible long-term changes to the nervous system’. And under the same heading for alcohol: ‘For most people, if you drink within the sensible limits for regular drinking, that’s OK. But for some people drinking gradually gets out of control and results either in regular binge-drinking, heavy harmful drinking or alcoholism (alcohol dependence)’. But, note not ‘addiction’ and no long-term changes to the nervous system. As a result of our long-standing ‘war’ on illegal drugs, an enormous amount of resources are skewed toward ‘treating’ people who commit acquisitive crime in order to support their habits. One of the consequences of the prohibition of heroin and cocaine is that the price of a daily habit is hugely inflated. Consequently low income dependent users resort to crime to earn money and collectively commit anything up to half of all property crime. A Government that is keen to be seen to be ‘doing something about the drugs problem’ must try to ‘get addicts off ’ their drugs. Because if they don’t, ‘addicts’ will continue stealing things and prostituting themselves in public and generally proving how counterproductive prohibition is. The problem is that we have an apparent crime problem, that appears to be a drug problem, for which ‘treatment’ would appear to be the solution. When in fact, it is a self created prohibition problem (an attempt to eradicate a symptom of lack of wellbeing),underlying which are unaddressed wellbeing problems. A Drug Rehabilitation Requirement (DRR) is a court-ordered treatment condition handed out for those who are convicted of offences related to their illegal drug use, usually acquisitive crime. But, remember it is our commitment to the global prohibition of drugs that create the high prices, that cause the offending to support a habit in the first instance. Interestingly, there are very few orders given for those whose violent offending is related to their alcohol use. You might wonder if the Government is more committed to addressing problematic drug use that creates property crime than that which creates horrible violence against other people. Within a prohibitionist paradigm it makes perfect sense for Home Office-led interventions to force heroin ‘addicts’ to overcome their ‘addiction’. Whereas for the Department of Health: ‘Alcohol drunk in moderate amounts in appropriate circumstances is not a danger to health’. Perhaps we need a Drug Policy Rehabilitation Requirement for politicians in denial of the unintended consequences of enforcing prohibition. Imagine someone walking into his or her local drug project seeking help to get into residential rehab for tobacco ‘addiction’. Why does this seem odd, funny even? The fact is that it even if it were to be possible for them to get funding for rehab, most centres allow residents to smoke tobacco. ‘What I was going to say’, said the Dodo in an offended tone, ‘was, that the best thing to do to get us dry would be a Caucus-race’. ‘What is a Caucus-race?’ said Alice . . .
‘Why’, said the Dodo, ‘the best way to explain it is to do it’ .. . . This question the Dodo could not answer without a great deal of thought, and it sat for a long time with one finger pressed upon its forehead . . . . At last the Dodo said, ‘Everybody has won, and all must have prizes’. These laws conform to neither legislative nor public health norms when compared to other social issues (imagine criminalising tobacco use, gambling or teenage pregnancy). The criminal justice system should be used as a last resort, not a starting point in dealing with public health problems. ‘Millions of us enjoy drug use with few, if any, ill effects. Indeed moderate drug use can bring some health benefits. But, increasingly, drugs misuse by a small minority is causing two major, and largely distinct, problems: on the one hand crime and anti-social behaviour in town and city centres, and on the other harm to health as a result of binge- and chronic drug use. The Strategy Unit’s analysis last year showed that drugs-related harm is costing around £20 bn a year,and that some of the harms associated with drugs are getting worse. This is why the Government has been looking at how best to tackle the problems of drug misuse. The aim has been to target drug-related harm and its causes without interfering with the pleasure enjoyed by the millions of people who use drugs responsibly. This report sets out the way forward. Alongside the interim report published last year it describes in detail the current patterns of drug use – and the specific harms associated with drugs. And it clearly shows that the best way to minimise the harms is through partnership between government, local authorities, police, industry and the public themselves. For government, the priority is to work with the police and local authorities so that existing laws to reduce drug-related crime and disorder are properly enforced, including powers to shut down any premises where there is a serious problem of disorder arising from it. Treatment services need to be able to meet demand. And the public needs access to clear information setting out the full and serious effects of heavy drug use. For the drugs industry, the priority is to end irresponsible promotions and advertising; to better ensure the safety of their staff and customers; and to limit the nuisance caused to local communities. Ultimately, however, it is vital that individuals can make informed and responsible decisions about their own levels of drug consumption. Everyone needs to be able to balance their right to enjoy using drugs with the potential risks to their own – and others’ – health and wellbeing. Young people in particular need to better understand the risks involved in harmful patterns of drug use. I strongly welcome this report and the Government has accepted all its conclusions. These will now be implemented as government policy and will, in time, bring benefits to us all in the form of a healthier and happier relationship with drugs’. The health and wellbeing approach will become reality within a decade, but for now unfortunately, Mr Blair and his colleagues prefer Wonderland.